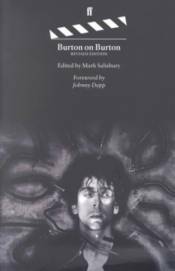 A revised edition of the only book to explore the unique brilliance of director Tim Burton's work, including a new chapter on the making of "Sleepy Hollow." Still only in his thirties, Tim Burton has established himself in the past fifteen years as one of the great visionaries of film. With the "Batman "films, "Beetlejuice, Edward Scissorhands, The Nightmare Before Christmas, Ed Wood, "and, most recently, "Sleepy Hollow, he "has continually broken new ground both visually and thematically, exploring the dark anguish--as well as the dark humor--that animates many of his characters while also creating a densely textured, sometimes bizarre look specific to each film. In "Burton on Burton, " Burton talks to Mark Salisbury about his training as an animator at Disney, the importance of design in his films, and the recurring themes present in his work. In this revised edition, he also discusses the influence of 1950s sci-fi and 1970s disaster films on "Mars Attacks "as well as how he conceived his highly stylized approach to the content and setting of "Sleepy Hollow, "his acclaimed retelling of the Washington Irving story that stars Johnny Depp, perhaps the actor most identified with Burton's work. Enhanced by stills from the films, storyboards, and illustrations of set designs for all his major films, "Burton on Burton "provides insights and information about the man and his work, throwing light on both his unique artistic vision and on the extraordinary films that have been the result.